Did I mention I'm trying to cut back on my baking? Well, not so much the baking as the eating of the baked goods. These are a bit of an in-between. I'm not sure they can honestly be called 'healthy'. They have about the same calories as a Mars bar, but they do have way more nutritional value. Pretty easy to make too, and very tasty. Yes, a new sewing project! Wow it's been a long time. I suppose I've had less reason to sew recently but with the wedding planning getting going again I was inspired to start something new. It's quite exciting actually. I've chosen my wedding dress, I can't show you because it's a surprise, but it's very cool. 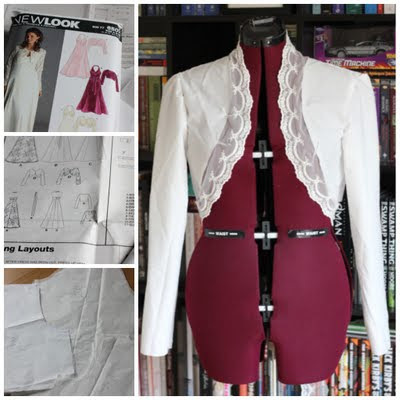 I did originally think that I might make my own dress, but I'm glad I changed my mind. It's much less stressful to know I can leave that up to someone else. I do want to make some things though. It seems silly not to use my skills and also it adds a more personal element, knowing you've put work into creating something. Since we are getting married in October I thought a jacket might be in order in case it's chilly. You never know with the weather in this country, it might be a bright autumn day or a dark winter one. 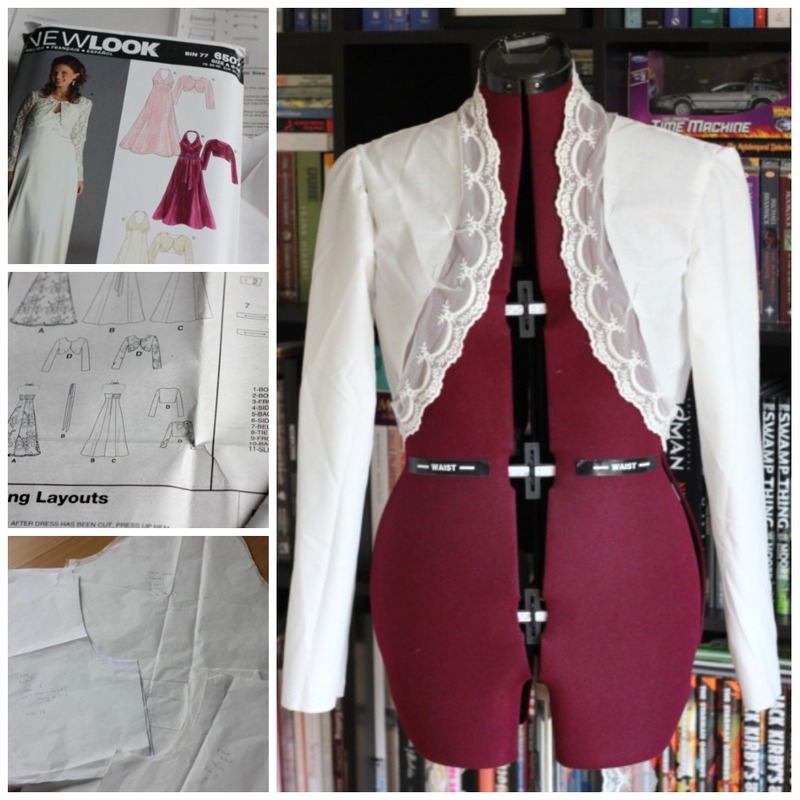 So here it is - a prototype for a wedding bolero/shrug type thing. I started off with New Look pattern 6507. I changed the shape of the front quite a lot and made it shorter. I also thought about maybe making the top of the sleeves a bit puffier? I've been very good and transferred my changes back to my paper pattern for when I make the real thing. The final one will probably be a different colour so I'll need to find some more lace or create a ruffle for the edge. It's a shame really as that one works nicely!